Welp, I just got off the phone with him, and he basically affirmed everything he said before. His explanation was that there are a lot of team drivers working west of the Rockies, and so in order to get them home time, solo drivers are limited to the east. I asked about taking home time in the west, and he said that would only be allowed if it was my officially declared permanent residency. i.e. make my buddy's house in Spokane "home" and get mail there, etc. Which I guess I could do, though I was kind of hoping to do that with my mom in Florida, since no state income tax. Frustrating because Prime was my #1 choice based on the research I'd done, and now I'm looking at other companies. FWIW, Schneider also has said the same thing about new guys sticking to the eastern 37, though I haven't pressed them for details yet. Eddie F., I’d talk to another recruiter at Prime, Inc. I think this is what I may need to do. He said he was trying to be sure not to make promises he couldn't keep, which I appreciate, but it may be there's some miscommunication between dispatch and recruiters. I gather these guys work on commission ... what's the best way to get in touch with someone else other than calling and just saying "let me talk to someone other than that guy?" Huh? Prime told you that your first year you would be east of the Rockies? I can assure you my first year at Prime I hit all 48 states. Ayup. Just got off the phone with recruiter an hour ago. West Coast only if I was part of a team, not solo. This doesn’t make any sense. I’m teaming right now and have been to MO, KS, ID, TX, IL, WY, NE, FL, AZ... wait are you doing reefer or tanker or flatbed? Tanker mostly run out east! Yes, if you're teaming you can go anywhere. What he told me was that newbies who are NOT teamed are limited to the eastern 37 or 38 states. I don't want to be teamed. He also mentioned that I'd be required to get a tanker endorsement, so maybe they're steering all new guys to that now? I dunno. Does anyone have any insights on what Rainey suggested? If after a couple months on the job I just started saying "I wanna spend my next home time in Spokane/LA/Vegas/etc." would that get me routed over there? I'm sorry, I misunderstood part of that. Much of our freight has become regionalized. There are still a lot of opportunities to go all over the country though. Personally I think you'd find that once you've established yourself as a good solid driver at either one of those two companies you mentioned, they'd be willing to send you to whatever part of the country you requested. Daniel B was solo at Prime and he was in all parts of the country. No worries. I totally get why companies are not enthusiastic about sending newbies over Wolfcreek Pass in January, and don't blame them at all. On the other hand, spending most of the year driving over roads I've already been on would be kind of heartbreaking for me. Reefer companies are likey your best bet for cross country trips. 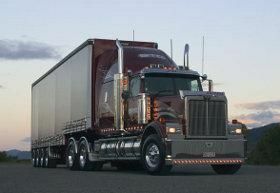 I'm with Pride Transport - we go coast to coast from Day 1 and hit around 38 states or so. Pride is a 500 truck company based in SLC. They'll hire you from anywhere in the 48 on a drive/fly program if you can stay out several weeks or more, and hire from a smaller area if you need more frequent home time. Cool, I will check them out. Thanks! a sure fire way to get west is 1) request home time out there. 2) go into tge terminal for truck repairs then ask for a load west going out. This might be the best suggestion of all. I don't really need much home time in my official home -- I'm single, no kids, and have just as many friends in other parts of the country -- specifically LA, Vegas and Spokane. If after a couple of months solo I request to spend my next home time at my friend's place in Spokane, would I get some runs over that way? Why do you want to team drive? So I have my permit and am looking to pick a company and/or school. But I've been very disappointed that the first two companies I've talked to (Schneider and Prime) have both said that I'd only be east of the Rockies in my first year. That's nearly a deal breaker for me ... a big part of why I want to do this is to see the country, and ruling out the prettiest parts kind of misses the point. Can anyone recommend a big companies that lets drivers do all 48 states in their first year? So I've been thinking seriously for a few weeks now about getting my CDL and working OTR. And after reading a slew of articles and posts, I've come to two conclusions. 1) I really, really want to do this. 2) After a year or two, I'll probably be really, really sick of it. As everyone says, it's not a job, it's a lifestyle; I'd even use the term "adventure." To analogize, a few years back I spent six months living out of a backpack and hiking the entire Appalachian Trail. I had zero hiking experience before I started getting ready and planning, but the adventure bug bit me and I followed it. It was a whale of fun, best thing I've ever done ... but by the end of six months, lemme tell ya, I had no desire to haul that pack anymore. That's kind of where I am with trucking. I have no wife or kids or mortgage, so I'm free to live for myself, and given that I'm dying to quit my current job, the idea of driving around the country and getting paid for it -- even $40K -- sounds thrilling, especially given that after a year I'll be set up to make bigger money if I want/need to ... having said that, I anticipate that after 12-24 months of living in a cab i'm going to want to move to something more 9-5, home-by-supper. Yes, I know that switching to regional is an option, but my question is more about what kind of jobs are available on the dispatch/front office side. One of my best buddies is a dispatcher with a smaller company, and his job seems pretty sweet -- he makes upper-end driver money, and is home by 7 most every night. But, he had something like ten years experience before he took that job, and he's been with that company for a long time, and didn't have a lot of insights into what the market is like. So for you guys at big places like Swift or Schneider or whatever -- what kinds of jobs could I hope to be getting into after a couple years' loyal service? I actually have an MBA that I've never used (looong story) ... would an academic background like that combined with a year of experience set me up to be a dispatcher, or are they gonna want me to have a lot more miles under my belt? So I'm considering making a career change into the industry, and I'm looking for suggestions for what companies might be the best choice in my situation. I'm a 47 year old guy, recently divorced, currently in the DC/Baltimore area but by no means committed to living here. I have pretty much no need for "home time" since I basically have nowhere that is "home" ... I want to put all my crap in storage and live the OTR life for a year or two. A couple days in Florida to visit mom, a couple days in PA to visit with my brother, a couple days in Spokane or Oklahoma City or LA or SF where I have friends or that I've never been ... other than that, I just want to keep my wheels moving for awhile. After a year or two, maybe I'll look to settle down again and start looking for more home time, but right now I want to leverage my rootlessness and make cash. The two other things I do want are 1) solid insurance package and 2) a truly national company; I want to see as much of the country as possible. Trips into Canada or Mexico would be awesome, too. -- Am I better off paying for my training myself ($3,000 at the community college) and then looking for a company to reimburse, or getting a company to pay and then I owe them service time? -- Which companies are best for getting max $ in the first year? -- Which companies would most value my willingness to stay out a long time? FWIW, I do have one minor accident on my driving record from three years ago, another 25 years ago. No tickets or points though. Nothing criminal in 20 years. Not a veteran, unfortunately.